Professional communication sent in style - Jukebox custom printed envelopes perfectly match a polished business identity. Combine them with our stylish letterheads for the full effect. Envelopes printed with your business information show your attention to detail and dedication to your brand. Unlike most printers, we allow the freedom to customize the entire envelope with full colour printing - even on the flap! Our envelopes boast an unbelievably smooth, classic feel. Our finest paper and highest print quality makes for an impeccable presentation. 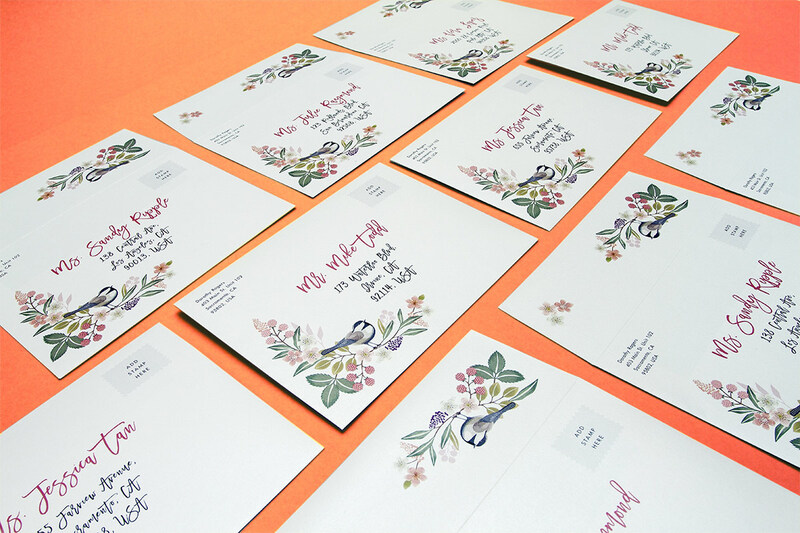 Looking for printed envelopes to match your wedding invites or flyers? We can create custom sized envelopes in exciting paper options like Kraft, Pearl and more. Submit a custom print request for details. A7 - 7.25" x 5.25"
Go unique with custom printing on the flap of your envelope. It adds class and can be unique on each envelope. View more ideas of what’s possible. Can you print full colour envelopes with dynamic printing? Yes, we can! Customizing your envelopes just got a whole lot easier! If you need to print a different name and/or address on your envelopes, you can do so with our Dynamic Printing services. These are perfect for any events, special occasions such as weddings, mail outs or other promotional materials. Our Dynamic Printed Envelopes are completely customizable - print your own design in full colour on the front and even on the flap. Be unique and don't waste any more time with labels (we think they're tacky)! Pearl Silver - 4" x 6", 5" x 7"
Cotton (with square flaps) - 4" x 6", 5" x 7"
Classic White - 9" x 12"
Need to see and feel a sample? Samples may be ordered through a Specialty Sample Pack from our Sample Pack Request page. Alternatively, you can pick up samples at any of our offices. What size is a #10 Envelope? If you order this windowed, the window placement will be 1/2" from the bottom and 7/8" from the left side, as indicated in our template. This is a standard business size envelope (also know as "commercial" or "legal" envelope). This envelope fits an Letter size sheet of paper folded into three-panels. This is an envelope size commonly used by companies to send bills and invoices. The size of a #10 Envelope is 9.5 x 4.125 inches. Can you print pre-addressed envelopes? If you are looking for each of your envelopes to be printed with a different address (ready for mailing) – we can do this only with Digital Output printing; with Dynamic Printing service. This is only suitable for smaller quantities (up to 250 quantity). Please place a Print Quote request to receive pricing, additional costs apply. We can print your return-address onto your envelopes (in fact we recommend you do this). We are able to print the "Postage Paid" section on envelopes – however you the customer (or designer) are responsible for organizing this with a postage service and setting up the design correctly. Do you fill envelopes for mailing? We do not offer a service to package, stuff or assemble printed materials and put them into envelopes. Are your Envelopes security printed? We can offer this feature on our Offset Output #10 envelopes (windowed or non-windowed) and Offset Output 9" x 12" envelopes. You can submit a Print Quote request to have this added to your envelope order. We will print them with a standard security pattern, however if you want us to use your own custom design, you may request this as well. Security printing (also referred to as "security tinting") is an additional design printed on the inside of an envelope (usually a complex pattern) to prevent the contents from being read through the envelope. This is important when sending confidential information via post. This is a clear section in the envelope (covered with clear plastic) so that the inside of the envelope can be viewed. The window is placed in the lower left corner of the face of the envelope – this is a standard window placement for alignment with address details on letters and invoices inside. Our #10 Envelopes come with the option to add a window. Can I move the placement of the window on my Envelopes? No, we cannot move the position of the window. This is a standard placement for the window that is widely used. There are other window placements used by some companies on a #10 envelope, so please refer to our template to ensure our positioning will work for your needs. What size envelope should I order for my flyer / invitation? Our #10 Envelopes will hold 8.5" x 11" Trifold brochures and 4" x 9" Rack Cards, and can be ordered with Offset output printing. As a general rule, the envelope should be at least 0.25” larger (in width and height) than the items you want to put inside. Thicker content may require a larger envelope. We offer the option to add blank envelopes to fit the size of your Wedding Invites when ordering on our website. If you are ordering Flyers, you can call our Customer Service line to add envelopes to your order. If you are looking for blank envelopes in a matching stock to your Invites or Flyers, please submit a Print Quote request and our Estimations team can give you options and pricing. If you would like printed envelopes to fit a Flyer or Invitation order, this can also be ordered through a Print Quote request. We have several different sized envelopes available. request. Please note that these types of orders will require you to submit your own die-line file, and will incur a charge for a new die to be created for your specific shape and size. We cannot offer the template of our Sample Packs to customers; these are for Jukebox Print use only. If you are unable to create your own die-line file or template, our design team can create this for you as part of a Design Service. How do I design envelopes suitable for post? Our Envelope Layout Templates show the set-up required for a printable file; they do not show guidelines to make the envelopes suitable for post. Please confirm with your local post service regarding specific guidelines and requirements for your envelope to be suitable for posting. 9" x 12"#10 (4.125" x 9.5")A7 - 7.25" x 5.25"A6 - 6.5" x 4.75"
If you are placing an order for a pre-made shape by Jukebox (such as a shaped business card, gift card holder, hang tag or envelope), be sure to use the appropriate template for your desired shape as this will include the dieline and proper guides such as safety margin and bleed. Slight shifting will occur between all stages of the production process, which is unavoidable for any printer. As such, we do not recommend to attempt to register your printed design perfectly along the score lines, as some shift is likely to occur. This can cause unwanted results, such as part of the artwork to shift over onto the next panel. Leaving a margin of 0.125" between your artwork and the score lines will help avoid this from occurring. Bleed is the artwork that extends past the trim line or finished size of your product. If the envelope you are ordering allows for full bleed printing, make sure that any element of your artwork that you intend to be printed to the edge is extended past the trim line and into the bleed area by a minimum of 0.125".